A United States Marines artillery unit, as well as Army Rangers, have been deployed to Syria to aid in the assault on the de facto capital of the Islamic State group, Raqqa. The goal of the deployment is to expedite the defeat of the group in a battle that in recent days has been called "difficult and complicated." But the U.S.-led coalition on Thursday insisted attempts to isolate the city held by the extremist group are going "very, very well." The United States said forces total 400 – this is in addition to the 500 U.S. military personnel already in the country, deployed during the Obama administration. U.S. Air Force Col. John Dorrian, speaking for the coalition, said the additional forces would be working with partners in Syria, the Syrian Democratic Forces and the Syrian Arab Coalition, but would not have a frontline role. Despite such assurances in the past, however, members of the U.S. armed forces have been killed in Syria. Senior Chief Petty Officer Scott Dayton was killed on Thanksgiving Day. Visitors walk inside Aleppo's Umayyad mosque, Syria October 6, 2010. REUTERS/Khalil Ashawi SEARCH "ALEPPO HERITAGE" FOR THIS STORY. SEARCH "WIDER IMAGE" FOR ALL STORIES. Men walk near damage inside Aleppo's Umayyad mosque, Syria December 17, 2016. REUTERS/Omar Sanadiki SEARCH "ALEPPO HERITAGE" FOR THIS STORY. SEARCH "WIDER IMAGE" FOR ALL STORIES. A combination picture shows Aleppo's Umayyad mosque, Syria, before it was damaged on October 6, 2010 (top) and after it was damaged (bottom) December 17, 2016. REUTERS/Khalil Ashawi (top)/Omar Sanadiki SEARCH "ALEPPO HERITAGE" FOR THIS STORY. SEARCH "WIDER IMAGE" FOR ALL STORIES. People walk inside Aleppo's Umayyad mosque, Syria March 12, 2009. REUTERS/Omar Sanadiki SEARCH "ALEPPO HERITAGE" FOR THIS STORY. SEARCH "WIDER IMAGE" FOR ALL STORIES. Damage is seen inside Aleppo's Umayyad mosque, Syria December 13, 2016. REUTERS/Omar Sanadiki SEARCH "ALEPPO HERITAGE" FOR THIS STORY. SEARCH "WIDER IMAGE" FOR ALL STORIES. A combination picture shows Aleppo's Umayyad mosque, Syria, before it was damaged on March 12, 2009 (top) and after it was damaged (bottom) December 13, 2016. REUTERS/Omar Sanadiki SEARCH "ALEPPO HERITAGE" FOR THIS STORY. SEARCH "WIDER IMAGE" FOR ALL STORIES. A combination picture shows Shahba Mall, one of the largest commercial shopping centres in Syria, before it was damaged on December 12, 2009 (L) and after it was damaged (R) on October 16, 2014. REUTERS/Khalil Ashawi (L)/Abdalrhman Ismail SEARCH "ALEPPO HERITAGE" FOR THIS STORY. SEARCH "WIDER IMAGE" FOR ALL STORIES. A woman carries an umbrella in al-Sheebani school, in the Old City of Aleppo, Syria May 14, 2008. REUTERS/Omar Sanadiki SEARCH "ALEPPO HERITAGE" FOR THIS STORY. SEARCH "WIDER IMAGE" FOR ALL STORIES. A general view shows damage in al-Sheebani school building, in the Old City of Aleppo, Syria December 17, 2016. REUTERS/Omar Sanadiki SEARCH "ALEPPO HERITAGE" FOR THIS STORY. SEARCH "WIDER IMAGE" FOR ALL STORIES. A combination picture shows al-Sheebani school's building, in the Old City of Aleppo, Syria before it was damaged on May 14, 2008 (top) and after it was damaged (bottom) December 17, 2016. REUTERS/Omar Sanadiki SEARCH "ALEPPO HERITAGE" FOR THIS STORY. SEARCH "WIDER IMAGE" FOR ALL STORIES. A damaged chandelier lies on the ground at Hamam El Nahasin, in the Old City of Aleppo, Syria December 17, 2016. REUTERS/Omar Sanadiki SEARCH "ALEPPO HERITAGE" FOR THIS STORY. SEARCH "WIDER IMAGE" FOR ALL STORIES. A combination picture shows Hamam El Nahasin, in the Old City of Aleppo, Syria before it was damaged on October 6, 2010 (top) and after it was damaged December 17, 2016. REUTERS/(Top)Khalil Ashawi/Omar Sanadiki SEARCH "ALEPPO HERITAGE" FOR THIS STORY. SEARCH "WIDER IMAGE" FOR ALL STORIES. People attend a music concert in al-Sheebani school's courtyard, in the Old City of Aleppo, Syria June 6, 2009. REUTERS/Omar Sanadiki SEARCH "ALEPPO HERITAGE" FOR THIS STORY. SEARCH "WIDER IMAGE" FOR ALL STORIES. A combination picture shows al-Sheebani school's courtyard, in the Old City of Aleppo, Syria before it was damaged on June 6, 2009 (top) and after it was damaged December 17, 2016. REUTERS/Omar Sanadiki SEARCH "ALEPPO HERITAGE" FOR THIS STORY. SEARCH "WIDER IMAGE" FOR ALL STORIES. A general view shows the entrance to al-Zarab souk in the Old city of Aleppo, Syria November 24, 2008. REUTERS/Omar Sanadiki SEARCH "ALEPPO HERITAGE" FOR THIS STORY. SEARCH "WIDER IMAGE" FOR ALL STORIES. A general view shows damage on the entrance to al-Zarab souk in the Old city of Aleppo, Syria December 13, 2016. REUTERS/Omar Sanadiki SEARCH "ALEPPO HERITAGE" FOR THIS STORY. SEARCH "WIDER IMAGE" FOR ALL STORIES. A combination picture shows the entrance to al-Zarab souk in the Old city of Aleppo, Syria November 24, 2008 (top) and after it was damaged December 13, 2016. REUTERS/Omar Sanadiki SEARCH "ALEPPO HERITAGE" FOR THIS STORY. SEARCH "WIDER IMAGE" FOR ALL STORIES. Men walk near damage inside Aleppo's Umayyad mosque, Syria December 13, 2016. REUTERS/Omar Sanadiki SEARCH "ALEPPO HERITAGE" FOR THIS STORY. SEARCH "WIDER IMAGE" FOR ALL STORIES. A combination picture shows Aleppo's Umayyad mosque, Syria, before it was damaged on March 12, 2009 (top) and after it was damaged December 13, 2016. REUTERS/Omar Sanadiki SEARCH "ALEPPO HERITAGE" FOR THIS STORY. SEARCH "WIDER IMAGE" FOR ALL STORIES. A general view shows the Old City of Aleppo, Syria November 24, 2008. REUTERS/Omar Sanadiki SEARCH "ALEPPO HERITAGE" FOR THIS STORY. SEARCH "WIDER IMAGE" FOR ALL STORIES. A combination picture shows the Old City of Aleppo, Syria on November 24, 2008 (top) and after it was damaged December 13, 2016. REUTERS/Omar Sanadiki SEARCH "ALEPPO HERITAGE" FOR THIS STORY. SEARCH "WIDER IMAGE" FOR ALL STORIES. A combination picture shows Aleppo's historic citadel, in the Old City of Aleppo, Syria before it was damaged on August 9, 2010 (top) and after it was damaged December 13, 2016. REUTERS/Sandra Auger (top)/Omar Sanadiki SEARCH "ALEPPO HERITAGE" FOR THIS STORY. SEARCH "WIDER IMAGE" FOR ALL STORIES. Dorrian said the initial mission could be competed in a few weeks. "Then the decision to move in could be made," he said. The group, once dominant in neighboring Syria and Iraq, is besieged. Reports earlier this week indicated that its leader, Abu Bakr al-Baghdadi, has personally fled the defense of Mosul, Iraq, another stronghold, leaving subordinates behind to finish the fight. The State Department hailed the effectiveness of one of the partners, as well as its associates, on Wednesday. "The Syrian Democratic Forces that are operating in northern Syria. They've been very effective... in removing [the Islamic State group] from the battlefield," State Department spokesman Mark Toner told reporters in Washington. "I think they've liberated some 6,000 kilometers and more than 100 villages from [the Islamic State group] around Raqqa since the operation began," in November. The recently-deployed Marines reportedly arrived in the past few days, establishing a position from which they will be able to fire at Islamic State positions some 20 miles away. Their role is to set up an artillery battery that could fire shells from M777 howitzers, officials say. The Rangers are positioned on the outskirts of Manbij, about 68 miles from Raqqa, an assignment that will last "for a temporary period," Dorrian said. It is unclear whether the U.S. deployment announced Thursday is a signal of future deployments, and a greater on-the-ground presence, from the United States. An Air Force F-22 Raptor flies over the Arabian Sea to support Operation Inherent Resolve, January 27, 2016. Navy Seaman Fabian Soltero looks through shipboard binoculars aboard the aircraft carrier USS Dwight D. Eisenhower in the Atlantic Ocean, March 25, 2016. USS Bulkeley receives fuel and cargo from dry cargo/ammunition ship USNS Medgar Evers during a replenishment at sea in the Persian Gulf, February 25, 2016. The guided-missile destroyer was supporting Operation Inherent Resolve, maritime security operations, and theater security cooperation efforts in the US 5th Fleet area of operations. Navy Seaman Brice Scraper, top, and Petty Officer 2nd Class Alex Miller verify the serial number of a training missile on the flight deck of the aircraft carrier USS Ronald Reagan in the Philippine Sea, October 5, 2016. The Reagan was supporting security and stability in the Indo-Asia-Pacific region. Navy Petty Officer 2nd Class Brianna Caballero maneuvers a harbor patrol boat to load it onto a trailer for maintenance on Naval Support Activity Bahrain, January 6, 2016. Soldiers offload equipment and supplies from a CH-47F Chinook helicopter after landing on Kahiltna Glacier in Denali National Park and Preserve, Alaska, April 24, 2016. At 17,400 feet, Mount Foraker towers above.Air Force Maj. Steve Briones and 1st Lt. Andrew Kim fly a KC-135 Stratotanker aircraft over Turkey, January 6, 2016. Coalition forces fly daily missions to support Operation Inherent Resolve.Members of the visit, board, search, and seizure team for the guided-missile destroyer USS Gonzalez operate a rigid-hull inflatable boat in the Gulf of Aden, April 26, 2016. The Gonzalez was supporting Operation Inherent Resolve, maritime security operations and theater security cooperation efforts in the US 5th Fleet area of operations. Air Force Maj. Steve Briones and 1st Lt. Andrew Kim fly a KC-135 Stratotanker aircraft over Turkey, January 6, 2016. Coalition forces fly daily missions to support Operation Inherent Resolve.Members of the visit, board, search, and seizure team for the guided-missile destroyer USS Gonzalez operate a rigid-hull inflatable boat in the Gulf of Aden, April 26, 2016. The Gonzalez was supporting Operation Inherent Resolve, maritime security operations and theater security cooperation efforts in the US 5th Fleet area of operations. Members of the visit, board, search, and seizure team for the guided-missile destroyer USS Gonzalez operate a rigid-hull inflatable boat in the Gulf of Aden, April 26, 2016. The Gonzalez was supporting Operation Inherent Resolve, maritime security operations and theater security cooperation efforts in the US 5th Fleet area of operations.Air Force Maj. Steve Briones and 1st Lt. Andrew Kim fly a KC-135 Stratotanker aircraft over Turkey, January 6, 2016. Coalition forces fly daily missions to support Operation Inherent Resolve.Soldiers offload equipment and supplies from a CH-47F Chinook helicopter after landing on Kahiltna Glacier in Denali National Park and Preserve, Alaska, April 24, 2016. At 17,400 feet, Mount Foraker towers above. Sailors move a T-45C Goshawk aircraft on the flight deck of the aircraft carrier USS Dwight D. Eisenhower in the Atlantic Ocean, February 5, 2016. The Eisenhower was preparing for inspections and conducting carrier qualifications. The guided-missile destroyer USS Carney breaks away from the fleet-replenishment oiler USNS Big Horn after a replenishment at sea in the Mediterranean Sea, August 14, 2016. The Carney was patrolling in the US 6th Fleet area of responsibility to support US national-security interests in Europe. A Marine Corps MV-22 Osprey aircraft prepares for takeoff from the flight deck of the amphibious assault ship USS Boxer in the Pacific Ocean, August 26, 2016. Navy Petty Officer 3rd Class Kristen Neufeld performs maintenance on a Mark 38-25 mm machine gun aboard the aircraft carrier USS Carl Vinson at its home port in San Diego, August 18, 2016. Sailors aboard the guided-missile destroyer USS Ross move ropes during a sea-and-anchor detail near Aksav, Turkey, January 7, 2016. The Ross was conducting a routine patrol in the US 6th Fleet area of operations to support US national-security interests in Europe. Navy Petty Officer 3rd Class Trevor Ellam signals to the fleet-replenishment oiler USNS Laramie from aboard the guided-missile destroyer USS Stout during a replenishment at sea in the Persian Gulf, October 14, 2016. Ellam is a boatswain’s mate. The Stout was supporting security efforts in the US 5th Fleet area of operations. Marines depart a CH-53E Super Stallion helicopter aboard the amphibious-assault ship USS Makin Island in the Pacific Ocean, October 22, 2016. The Makin Island was supporting the Navy’s maritime strategy in the US 3rd Fleet area of responsibility. The helicopter is assigned to Marine Medium Tiltrotor Squadron 163. Navy Petty Officer 2nd Class Matthew Fulks motions to crew members on the flight deck of the aircraft carrier USS John C. Stennis in the Philippine Sea, February 24, 2016. The Stennis provides a ready force to support security and stability in the Indo-Asia-Pacific region. The guided-missile destroyer USS Lassen patrols the eastern Pacific Ocean, March 10, 2016. The Lassen was supporting Operation Martillo with the US Coast Guard and partner nations within the US 4th Fleet area of responsibility. President Donald Trump is considering a new plan to defeat the Islamic State group that was submitted by the Pentagon late last month, the BBC notes. 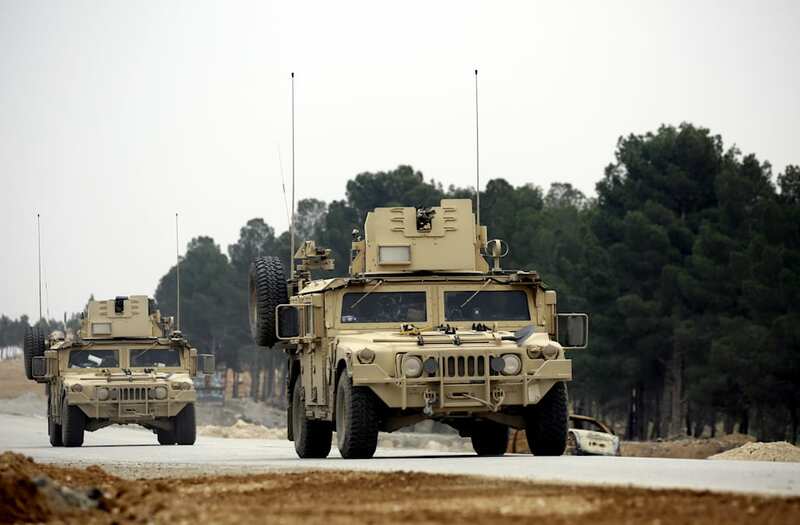 Reports indicate, however, that while the review may lead to an increase in the number of U.S. troops in Syria, it will not set off "a dramatic shift" in the strategy the president inherited. "As promised, I directed the Department of Defense to develop a plan to demolish and destroy [the Islamic State] – a network of lawless savages that have slaughtered Muslims and Christians, and men, and women, and children of all faiths and all beliefs," the president told Congress in his address last week. "We will work with our allies, including our friends and allies in the Muslim world, to extinguish this vile enemy from our planet."